Ralph Monaco, Jr. has never lived in a home that didn’t have a fire monitor, or scanner, on at all times. At the age of three he began hanging out with his father and older brother, Doug, at the Centreville Volunteer Fire Department, where his dad, Ralph, Sr., was Chief for 15 years. In 1974, at the age of 16, Ralph, Jr. became a junior member, launching a lifetime of service to his community. Now, some 41 years later, Ralph serves as Captain for Little Fork Volunteer Fire and Rescue Company, where his brother, Doug, is Chief. In the Chief and Deputy Chief’s absence, Ralph is the man in charge. As a Firefighter Officer II, he runs both fire and EMS calls, driving everything from the ambulance to the fire engine. Ralph is also one of two “at large” members of the Little Fork Board of Directors. The Board meets monthly to work out administrative issues such as budget items, disciplinary actions, etc. 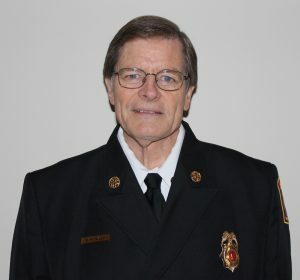 Back in the 1980s, Ralph began his career with an eight-year venture as a paid firefighter with the Federal Government, while selling real estate on the side. He just plain liked helping people! Eventually he made the decision to switch his priorities, becoming a full time real estate agent and a volunteer firefighter on the side. Growing up in his father’s heating and air conditioning business, specializing in new home installations, Ralph gained knowledge and insight about construction and housing as he worked for his dad through his late twenties. A career in real estate was a perfect fit for him. After taking the initial real estate course in 1986, Ralph became an agent with Better Homes Realty Company. He now has his broker’s license and has been an Associate Broker with Re/Max Regency for over 20 years, specializing in residential and land sales primarily in Fauquier, Culpeper, and Rappahannock Counties. Most of Ralph’s clients are repeat customers or referrals. He is committed to providing exemplary service because, as he put it, “Your reputation is everything!” His office is on Holiday Court in Warrenton. Ralph loves his work and has no plans to retire any time soon. He and his wife, Jody, enjoy the privacy of their 37 acres along the Hazel River in Rixeyville. He first got to know Jody when she joined the Centreville VFD. After dating for several years, the two were married in 1978. Jody now works in accounts payable for TLC Services, an HVAC contractor in Warrenton. The couple’s older daughter, Melissa, is the office manager for the same company. Both are supporting members at Little Fork, helping with fundraising efforts, and both have served as Treasurer in the past. Their younger daughter, Kimberly, who lives in Warrenton, is a budget analysist for the Federal Government. She is not a member of Little Fork but has helped with fundraising for Little Fork in the past. “Giving back to our community is what our country is all about,” Ralph added.